Another professional fencing job completed by our experienced team here at Liverpool One Fencing LTD. This fencing had blown down in the bad winds. We arranged a time and met up with the customer at her property in blundell sands, Crosby, Liverpool. 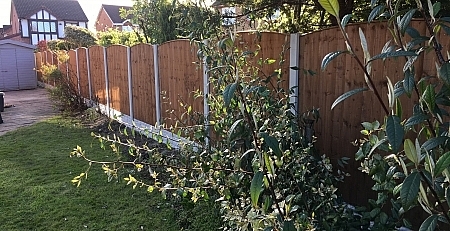 As the old fence had been fitted really badly and only screwed to the out side of the railway wall we advised that we would set timber posts in front of the wall an also fix the fence to the top copping stones. 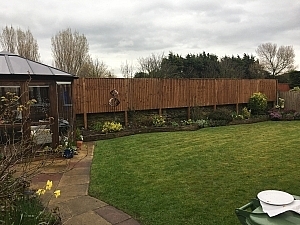 The type of fencing we decided on was treated vertical feather edge boards pinned to 4×2 treated rails. As we refer to this in the trade as (pin on). One thing I like about pin on is it gives a more uniform finish to the fencing (personal preference). 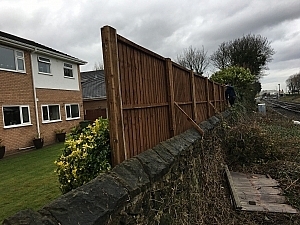 We are one of Liverpools leading fencing contractors and manufacture 95% of all our fencing & Concreat products which includes 7.9 concrete post, 6ft rock face base panels. Our fence panels are probably not the cheapest in Liverpool but one of the best made using quality treated timber. We love what we do and love a Chalange. Please keep us in mind for any future landscaping,fencing, General building. Chose Liverpools #no1 fencing contractor.